The image of a healthy person today does not necessarily include a deep, dark tan. Research has linked exposure to the sun's ultraviolet rays to skin cancer, premature wrinkles, and other skin problems. While protective clothing such as hats, pants, and long sleeve shirts are the most effective blocks against these damaging rays, sun-screen lotions also provide remarkable protection for the skin. The light emitted by the sun consists of three frequency bands of radiation: infrared, visible, and ultraviolet. Of the three, only the ultraviolet is harmful to most humans. Ultraviolet (UV) radiation is further divided into three categories: UVA, UVB, and UVC. UVA radiation penetrates the skin without burning the surface layers. These rays can penetrate to a depth of 0.04 inches (1.0 mm) and cause damage to cell membranes and the immune system. UVA radiation has been linked to skin cancers and premature aging and wrinkling of the skin. UVB radiation is responsible for the painful, red burn people get after prolonged exposure to the sun. UVB rays also cause skin cancer and can damage the cornea and lens of the eye. The third category, UVC radiation, is generally absorbed by the earth's atmosphere and is not considered harmful. Sunscreen lotions that provide protection against both UVA and UVB radiation are known as having a broad spectrum of protection. There are two basic types of sunscreen lotions on the market: products that penetrate the outermost layer of skin to absorb ultraviolet rays, and products which coat the surface of the skin to act as physical barriers to ultraviolet rays. Both of these types are rated with a sun protection factor (SPF), which lets the consumer know how much protection against UVB rays the product provides. The SPF of a product is the ratio of the time required for a person's protected skin to redden after being exposed to sun-light compared to the time required for the same person's unprotected skin to redden. For example, a product with SPF15 means that a person whose unprotected skin would redden in ten minutes can apply the product and stay in the sun 15 times longer, or 150 minutes, before they get a sunburn. Researchers believed for a long time that UVB rays—the rays that actually cause a sunburn—were solely responsible for all forms of skin cancer. However, recent studies prove that UVA rays are also responsible. Although many sunscreens now contain UVA protectors, there are currently no standards set by the Food and Drug Administration (FDA) for protection against UVA rays. The SPF rating on a product applies only to protection against UVB rays. The FDA requires strict regulations and testing prior to the manufacture of any new sunscreen lotion. Sunscreen producers go through an expensive and lengthy process to get FDA approval. This approval authorizes the manufacturer to produce the exact formulation applied for and is limited to only one SPF rating and one specific usage. Today's target market for sunscreens are highly specialized. Sunscreen products are continually being redeveloped to meet the changing needs of specific consumers. For instance, formulations for athletes may contain ingredients which are more waterproof and sweatproof to provide protection for up to eight hours. Athletes may also desire a lotion that feels dry so as not to affect their grip. Children's skins are more sensitive than adults because the outermost layer is thinner. This supports the observation that most sun damage to the skin occurs during childhood and the early teenage years. Sun-screens developed for the children's market tend to contain natural ingredients such as aloe vera and vitamin E.
In the development phase for a new sunscreen, a team of chemists and lab technicians develop the sunscreen formulation from synthetic and natural ingredients. Initial formulations are made in quantities of 10 gallons (38 1) and are stored in stainless steel vats. These initial formulations are tested and finalized before an application to the FDA for approval is made. FDA approval requires further testing which may be done in-house or by an outside laboratory. Examples of the kind of testing required for FDA approval include tests to measure the effective sun protection factor according to FDA guidelines, tests to determine how safe the product is to use on the skin, and tests to measure the waterproof tolerance of a lotion. Many combinations of synthetic and natural ingredients may go into the formulation of a single sunscreen. A formulation is generally geared towards a specific SPF rating or the needs of a specific consumer group. Perhaps the best-known synthetic material used for protection against UVA rays is avobenzone, or Parsol 1789, which is used in products worldwide. Broad spectrum protection is provided by other synthetic ingredients such as benzophenone and oxybenzone, which protect by absorbing UV light. PABA (paraaminobenzoic acid) was once a popular UV-absorbing sunscreen ingredient, but it can cause skin irritation in some people and is now replaced by Padimate-O, a derivative of PABA. Other broad spectrum synthetic ingredients are octyl methoxycinnamate and menthyl anthranilate. Titanium dioxide is a natural mineral and a popular ingredient for broad spectrum protection. Titanium dioxide works by scattering UV light instead of absorbing it. Although not as opaque as zinc oxide, it has a similar whitening effect in the higher SPF ratings. Antioxidants are often combined with titanium dioxide to slow down the oxidation of oils and thereby delay the deterioration of the lotion. Some examples of natural antioxidants are vitamins E and C, rice bran oil and sesame seed oil. Another popular antioxidant in the natural category is green tea. Many newer sunscreen products also contain skin soothing and moisturizing additives such as aloe and chamomile. Sunscreen products may be manufactured, bottled, and shipped from a single facility, or portions of this work may be handled out-side of the company. The fully automated manufacturing process described here uses some of both approaches. 1 Water is purified using a method called reverse osmosis. Reverse osmosis extracts pure, fresh water by forcing water under pressure through a semipermeable membrane which separates pure water molecules from salts and other impurities. 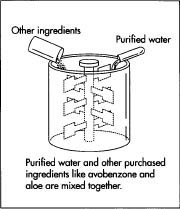 2 Ingredients are purchased from outside sources and mixed with the purified water according to the recipe of the final formulation. The recipe is recorded on a vat sheet which lists the exact measurements for each ingredient. Measurements are converted from the initial 10-gallon (38 1) recipe used in the development stage to larger quantities for commercial use. 3 A blow molding facility manufactures the plastic containers for the sunscreen. In some cases this is done outside of the company. Blow molding is a method in which thermoplastics, plastics which soften when heated and harden when cooled, are extruded into a tube, called a parison, and placed into an open mold. The mold is closed around the heated parison, and the parison is pinched at the bottom to form a seal. Compressed air is blown through the top of the parison which forces the softened plastic to expand to the inside walls of the mold, creating the shape of the container. 4 Containers are moved to a printing facility where logos and product information are printed and, in some cases, stamped onto the containers. Stamping embosses thin metal foil onto the surface of the container in the desired shape, usually a logo. The printed or stamped containers are then stored for use when needed. 5 Stainless steel tanks with capacities up to 1,000 gallons (3784 1) are used in the filling process. Filling takes place in a separate, sterile room with a conveyor system of many incoming tracks. Machine operators monitor the automated process. Containers and caps enter the fill room on conveyor tracks. The sunscreen lotion flows from the vats through stainless steel piping to a pressure filling machine which inserts a retractable nozzle into each container and fills it with a measured amount of sunscreen lotion. 6 Most containers are capped automatically along the production line. Some containers include caps with pumps to allow easy dispensing of the sunscreen. These pump caps require manual assembly by operators as the containers leave the fill phase. 7 The filled and capped containers are boxed in quantities of 12 to be pelletized and secured to a skid by shrink wrapping for transport to distributors. been through the printing process and have flaws are passed on to other companies and made into products such as patio furniture. Researchers look to nature in search of the next wave in sunscreen development. Some plants have natural defenses against the damaging rays of the sun. For example the single-cell alga called Dunaliella Bardawil that thrives in the Dead Sea and the Sinai desert makes its own sunscreen. Scientists at the Weizmann Institute of Science in Rehovot, Israel, isolated the protein that this plant produces when sunlight gets too intense. The protein acts as a solar deflector by funnelling light down to where photosynthesis takes place. Excess light which could interfere with photosynthesis is shunned by a yellow-orange pigment produced by the algae. The human body also has a natural defense called melanin. Melanin is the brownish-black pigment found in skin and hair. It reflects and absorbs ultraviolet rays to provide a broad spectrum of protection. Dark-skinned people have a higher concentration of melanin and, as a result, have a lower incidence of skin cancer as well as less physical and medical signs of aging skin. Melanin was once painstakingly collected by extraction from exotic sources such as cuttle fish and cost about $3,000 per ounce ($101 per ml). However it can now be made in an inexpensive procedure using fermentation jars. One technology being used as a method of incorporating melanin into sunscreen lotions is to encapsulate it into microsponges which hold the melanin on the surface of the skin where it is most effective. The microsponges are invisible to the eye, and can only be seen under a microscope. Researchers continue to gain approval for the many uses of natural and synthetic melanin as an ingredient in sunscreen formulations. Conry, Tom, ed. Consumer's Guide to Cosmetics. Anchor Press/Doubleday, 1980. Winter, Ruth. A Consumer's Dictionary of Cosmetic Ingredients. Crown Publishers, 1984. Bylinsky, Gene. "Mass-Producing Nature's Sunscreen." Fortune, June 1992, p. 131. Davey, Tom. "Sunscreen Success Gives Biotech New Healthy Glow." San Francisco Business Times, October 1994, p. 8. Demetrakakes, Pan. "Packaging Patterns Make Mark On Makeup." Packaging, March 1994, pp. 20-21. Groves, Gordon A. "Toward More Effective UVA Protection." Drug and Cosmetic Industry, August 1994, pp. 37-38. Kintish, Lisa. "The Battle of The Sun." Soap/Cosmetics/Chemical Specialties For May, May 1993, pp. 42-48.